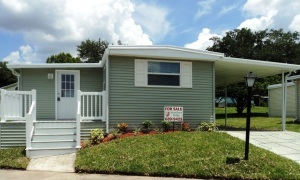 The Tampa, Florida, area certainly has no shortage of mobile homes for sale. Fortunately, if you are of retirement age or older, finding a great mobile home in a nice neighborhood is simple. Just be sure to focus your search on the mobile homes that are located inside 55+ communities. A 55+ community is one that is legally permitted to restrict residency to older individuals. Also referred to as age-qualified communities, active adult communities, and lifestyle communities, 55+ communities are specifically set up to accommodate the lifestyle preferences of older, active adults. Though not every 55 plus community is the same, it is common for them to have a wide range of amenities, plus an assortment of structured group activities happening throughout the week. Amenities often include a pool, hot tub, tennis courts, and a clubhouse with space for gatherings big and small. Buying a home in a 55+ community offers a winning combination of affordably priced housing and plenty of fun activities to partake in, all without having to venture outside the community’s gates. The 55+ community of StrawBerry Ridge just east of Tampa, FL, has long been a magnet for older adults seeking to live life to the fullest in a secure setting where the housing is affordable and the amenities first rate. StrawBerry Ridge – which is owned and managed by award-winning developer Blair Group – offers an excellent selection of custom-built mobile homes designed with low-maintenance living in mind. Plus, being a resident of StrawBerry Ridge means living right on the doorstep of one of the state’s most vibrant and dynamic metropolitan areas. You will be just a short drive away from historic Ybor City, the Straz Center for the Performing Arts, world-renowned beaches, and more! Contact the Lifestyle Team at StrawBerry Ridge to request a current listing of the mobile homes for sale at our 55+ community near Tampa, FL.